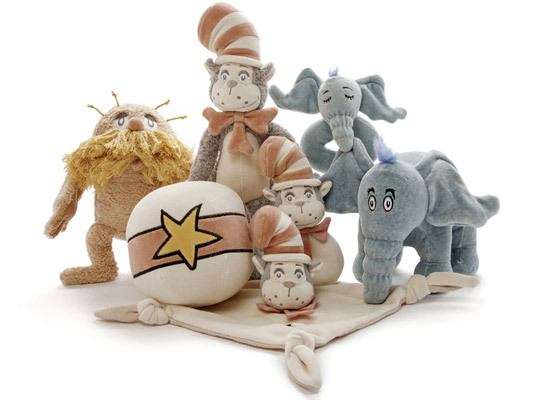 Oh, the places you’ll go with miYim’s Dr. Seuss Eco-Plush Collection. The whole gang’s here: the Cat in the Hat, Horton, and the Lorax, all sprung from the good doctor’s beloved children’s books. Beautifully rendered in untreated, unbleached cotton and chemical-free dyes, the certified-nontoxic range includes rattles, teething blankets, and plush toys. All that’s missing is a side of green eggs and ham. Treat your kiddo to one of these classic literary characters to honor Dr. Seuss’s birthday, which is today! I cannot connect with the web page to purchase the Dr Seuss toys. Is it n longer working or is this a seasonal item? Oh, the places you'll go with miYim's Dr. Seuss Eco-Plush Collection. The whole gang's here: the Cat in the Hat, Horton, and the Lorax, all sprung from the good doctor's beloved children's books. Beautifully rendered in untreated, unbleached cotton and chemical-free dyes, the certified-nontoxic range includes rattles, teething blankets, and plush toys. All that's missing is a side of green eggs and ham. Treat your kiddo to one of these classic literary characters to honor Dr. Seuss's birthday, which is today!